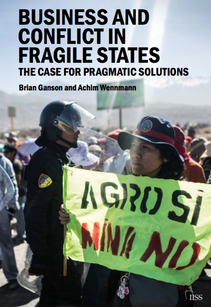 "Leaders of companies operating in fragile states will benefit from this book. It emphasises that business-related conflict and violence are not inevitable. Companies can contribute to ‘win–win’ solutions by investing in systematic and pragmatic solutions at a local level." "In a world in which unpredictability and insecurity have become the new normal, Ganson�and Wennmann provide a clear-eyed look at the lessons and evidence that can provide a new playbook for advocates, government officials and corporate executives alike who seek to harness the positive role of the private sector and avoid past pitfalls. Peace is possible, and the private sector can be a part of making that happen." "Ganson and Wennmann raise their heads above the heated melee that often overwhelms discussions on business and conflict. Their analysis sheds clear light on both the problems and the potential of existing approaches to business and conflict issues. Their insight on how to move forward is grounded in experience in, and solid reflection on, conflict mitigation and conflict management practices." Drawing�on decades of experience from mainstream conflict prevention and violence reduction efforts,�as well as promising company practice, they show that even acute conflict is manageable when dealt with pragmatically, locally and on its own terms. The analysis and conclusions of this Adelphi book will interest policymakers, business leaders and community advocates alike – all those hoping to mitigate today’s conflicts while helping to reduce fragility and build a �firmer foundation for inclusive development.